Ready to learn about growing radishes? They are one of the easiest things to plant and grow, and they mature faster than just about any other vegetable. This makes radishes a great way to get kids interested in gardening. Radishes prefer cooler weather and thrive in temperatures of 55-80 degrees. Any cooler and the seeds won't germinate. Any warmer and the root becomes woody and pithy. Since they like the cooler weather and mature so fast, it is usually quite easy to get two radish crops per year in most climates - one in the spring and another in the fall. Even if you only have 6 weeks before your first expected frost in the fall, you still have time to plant and grow radishes, as long as you plant a quick-maturing variety. Radishes can easily be grown in a container or in the ground. They are commonly grown with carrots. In fact, you can plant radish and carrot seeds together in the same row at the same time. The radishes will sprout much quicker and be ready for harvest about the time the carrot seeds pop up. Once you harvest the radishes, the carrots will have plenty of space to grow. In most conditions, radish seeds germinate in about 7 days and are ready for harvest in 25-65 days, depending on the variety. 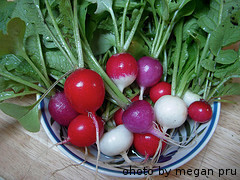 Radishes grow best in rich, fertile soil that is slightly acidic and drains well. They also do best in full sun. Radishes are commonly served raw or pickled. Surprisingly, radishes can also be cooked, which tends to bring out their sweetness. roasted radishes actually taste a lot like brussel sprouts - somewhat nutty and sweet. The tops of the plants are also edible and make a great peppery addition to salad and soups. Radishes are often carved into unique shapes and designs and used as a garnish. They come in a wide variety of colors including white, red, pink, purple and black. Some are round and others are oblong in shape. 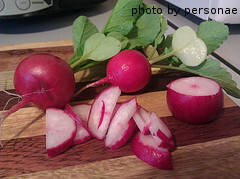 Most radishes are slightly spicy and provide a nice crunchy texture.